iPad 3: Will it Freeze? Have you ever had a device die when the weather got to cold? I don't think that's going to be an issue with the iPad. The case makers at ZooGue have come up with an excellent way to promote their new iPhone case. 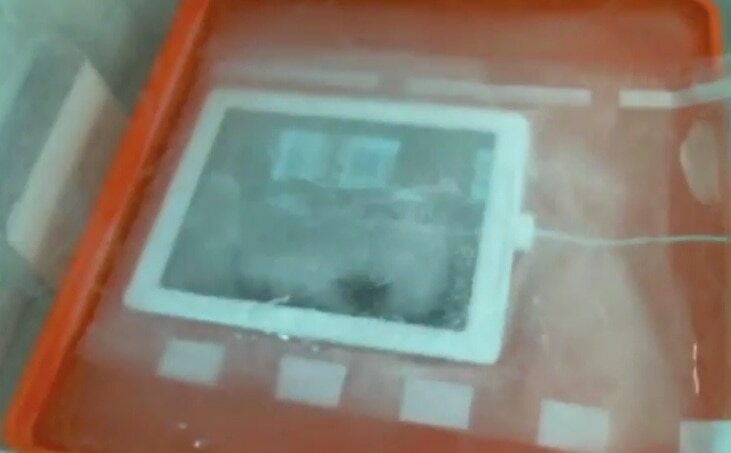 They froze an iPad in a block of ice - just to see if it would still work afterwards. They sealed it in a plastic bag (to prevent water damage) and they left it plugged in. And then they froze it over night in a commercial freezer. They shot the video throughout, including a time lapse segment where you get to watch it freeze. The screensaver changed often during the night, proving that the iPad is still operating. Of course, the fact that it was running constantly might be the reason it survived. The iPad doesn't release much waste heat but if the CPU and screen are on then that might be enough to resist the effects of the extreme cold. Also, the new iPad reportedly has an overheating problem. Not anymore, I'd say. Still, it's a neat video.We've seen the iPad blended, the Kindle Fire grilled, and now we get to see the iPad chilled. The best part, IMO, is when they break it out of the block of ice by dropping it on concrete. Man, this story bugs me to no end. An iPad is still considered a very high end item, and only the most privileged and/or hard working are lucky enough to own one. So for this company to destroy them just to try and sell a new iPhone case puts a real bad taste in my mouth. I for one will not support this company any longer.